For many indoor hydroponic gardeners light is a necessity in facilitating the growth of your crop whether it be a herb garden or strawberry patch. Which light should I use in my hydroponic garden you may ask? This choice should be made based on your garden size, the plant you’re growing, budget and complexity of your hydroponic system. Put simply plants use light as energy to produce their own food (photosynthesis) and for this light needs to hit their leaves (chlorophyll is where photosynthesis happens). So light is important, plants will not make their own food and won’t grow without it. There are many, many types of grow lights used by hydroponic gardeners, however, I’m here to explain one type; Metal Halide or MH Grow Lights, and by the end of this page you will know if these lights are for you. I’ll give my most basic explanation of how these MH lights work. Metal Halide lights come under the umbrella of High-Intensity Distribution lights, known to be a cheap yet an incredibly bright light source. This type of grow light gets its name from the reaction of the gas with metal halides (facilitated by electricity of course!). The Metal Halide HID is especially associated with indoor gardening because of their wide spectrum mimicking spring and summer sunlight making them one of the best grow lights ousting incandescent and fluorescent lights. Oh and I forgot to mention that most Metal Halide Grow lights simply screw into your light socket! 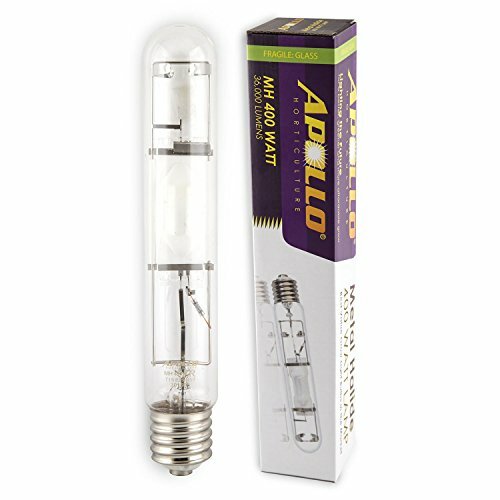 Apollo Horticulture dominates anything electrical hydroponic from bulbs to complete growing kits with reflectors, fans, and timer, as you will see in my number 4. This is easily the most popular MH bulb. Perfect for the small-scale hydroponic growers or those with small plants and small gardens who want a quality at a very modest price. MH grow lights have remained popular due to its energy efficiency and brightness, and with professional grade materials, Apollo does not disappoint. GE lighting isn’t known for its hydroponic lights despite its multi-national presence. GE’s MH grow light is not as popular as Apollo MH lights, GE is gathering more and more hydroponic gardeners and receiving rave reviews with satisfaction levels slowly overtaking that of Apollo MH lights. MH bulbs by GE are a little bit pricier than Apollo, well more than double but they must be doing something right. This light is of commercial quality, not so targeted at the first time hydroponic gardener with a little patch of strawberries. This light doesn’t fit into your regular light socket and has a mogul (very large) bulb fitting. This will suit a larger scaled gardener who wants commercial quality with great energy efficiency. Many would expect for iPower to come in just behind of Apollo in my top 5 best MH lights or some would say that iPower should top the list for MH grow lights. This brand is very well known and sits beside Apollo when it comes to all things grow lights. My justification for its number 3 placing is that I struggled to find great reviews on this product, yes they are popular but perhaps people are stuck in their comfort zone. In no way is this a terrible product, and sitting between 400W and 1000W it may decide that this product suits you, that you are slowly increasing your hydroponic garden and find the transition will be made much easier with a 600W MH bulb. I couldn’t help myself to put this on my list; it’s an all you need grow light set. I’m a sucker for value sets where you don’t have to look any further. It pricey, but at the end of the day, it’s an investment. I may be cheating here as this set comes with not only an MH bulb but also an HPS bulb (High-Pressure Sodium), which is another type of HID. It also includes a reflector, hanger, fan, and timer. Everything you need in terms of grow lights, as the HPS adds a different scale on the spectrum imitating the late afternoon, dark light of autumn winter. Another all in one set, and as you can see Apollo once again outranked iPower. The only difference in this package is that this does not include a timer. I for a fact do not like to switch things on and off at set times, but then again you may not be as lazy as me or you may have a specific cycle that changes and cannot be timed. Either way, this product did receive fewer reviews than the Apollo and alike my number 3 the most popular iPower set it comes in the 600W. This set is also available with 400W or 1000W bulbs if that more for you. Although the 600W seems to be more popular, maybe all there are much more in-between gardeners than I thought. 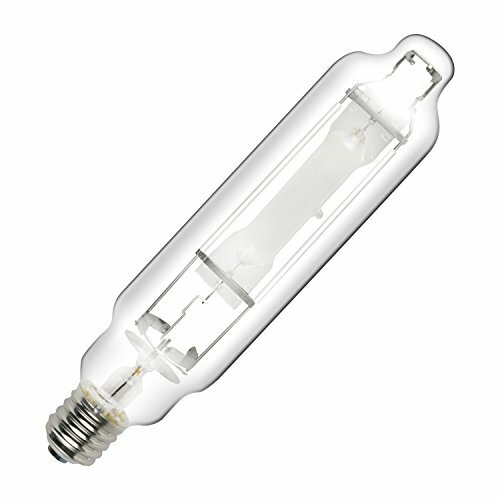 Not a bad product, another all you need set with again includes MH and HPS bulbs that cover a larger spectrum of light. These grow lights generally come in the following Wattage sizes and depending on your garden size and plant. One may be more appropriate for you. 400W bulbs can cover a garden of 2”x2” but no more than 3”x3” size. 1000W bulbs can cover a garden from 4”4 to maximum 6”x4”. MH grow lights can be used for both small and large plants, although the wattage size needs to be again considered. The 400W MH lights are better suited to smaller plants, as they are not strong enough to penetrate through a canopy. This is where the 1000W would be more practical, perfect for taller plants. MH Lights are not full spectrum like fluorescent lights or plasma lights. Now this doesn’t write these lights off straight away, MH lights mimic spring/summer sunlight. Spring and Summer being the perfect time of year for propagation and vegetative growth. If you’re looking for a grow light for seedling or flowering, this is not for you. Now to choose, at the beginning I mentioned the following factors; and we will use this to see if MH grow lights are for you. I’ll let you check the boxes. 400W MH grow lights are for you if.. If you can check all the boxes for either the 400W or 1000W grow lights than you need not look any further, unless you want a package deal with the inclusion of the HPS bulbs. I shouldn’t forget the in-between MH bulb, the 600W for the medium sized garden or for the hydroponic gardener who is slowly increasing the size of their indoor hydroponic garden. Don’t forget to check the prices in my top 5 as I have options for those on a small or large budget and those with a simple or more complex hydroponic set-up. To put things simply Metal Halide grow lights are for you whether you have a small or large garden space, have small or tall plants and need to replicate the summer/spring light cycle. Metal Halide bulbs provide a large lifespan and great energy efficiency, more so than the just as popular fluorescent grow light and can be easily plugged into (most) your light socket. As I mentioned before, if your required a light that needs to promote flowering or want a full spectrum light head towards the fluorescent or LED.